Two other rarities graded by NGC also realized more than $1 million. 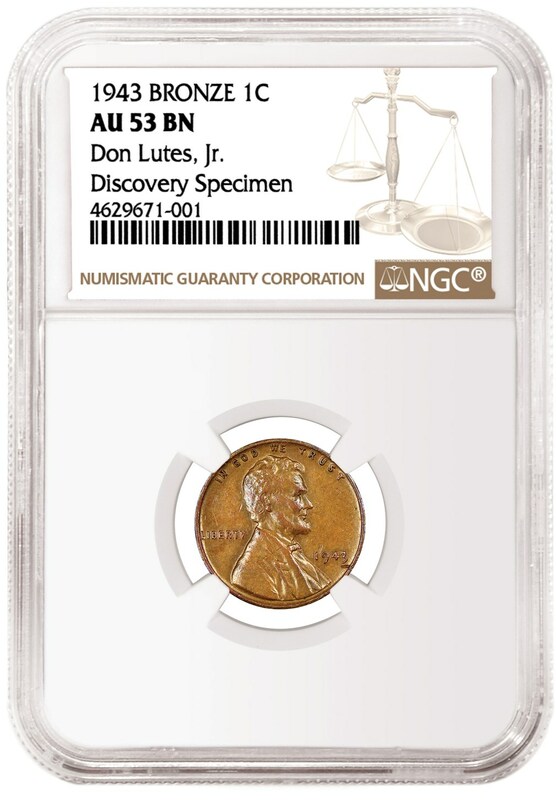 An 1885 Proof Trade Dollar certified by Numismatic Guaranty Corporation® (NGC®) realized an astonishing $3,960,000 at auction, one of the highest prices ever paid for a coin. This coin led a group of NGC-certified rarities that achieved extraordinary results in the Heritage Auctions Platinum Night sale, held January 10, 2019, at the FUN Show in Orlando, Florida. 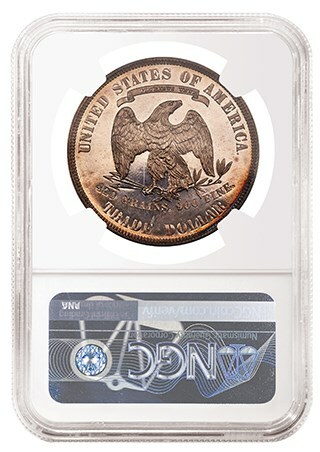 1885 Trade Dollar Proof, graded NGC PF 66. Realized: $3,960,000. Graded NGC PF 66 and pedigreed to the famous Louis E. Eliasberg Collection, the 1885 Trade Dollar is the finest of just five known examples. 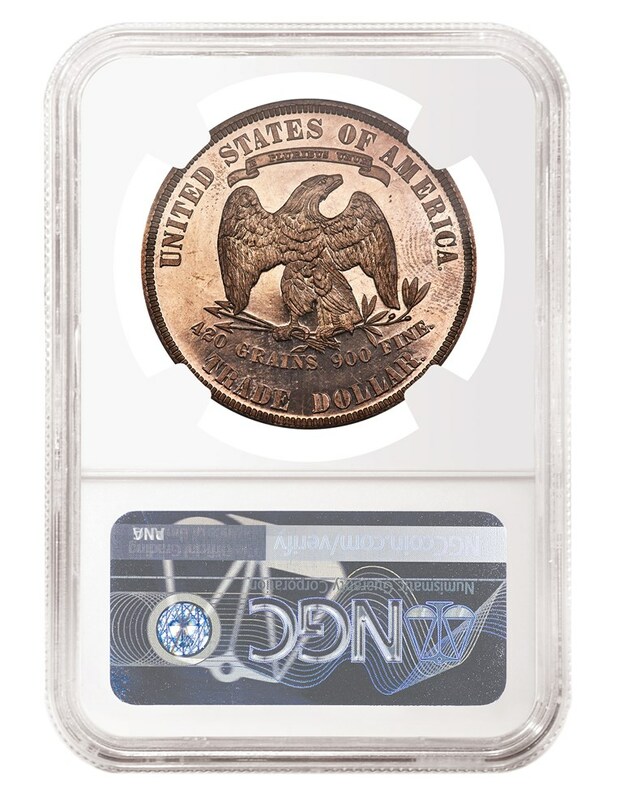 Its rarity, which is comparable to that of the legendary 1913 Liberty Nickel, makes it one of the most sought-after coins in American numismatics. The US minted about 35 million Trade Dollars in the 1870s to facilitate trade in Asia, but they failed to live up to expectations. They also became a nuisance in circulation at home due to the plummeting price in silver. The short-lived Trade Dollar is the only US coin to have had its status of legal tender revoked by Congress. Though the minting of circulation issues stopped in 1878, proofs continued to be produced through 1885. Trade Dollars have the same diameter and silver content as the Seated Liberty Dollar that preceded it, and feature a seated Liberty figure on the obverse and an eagle on the reverse that are both reminiscent of the earlier design. 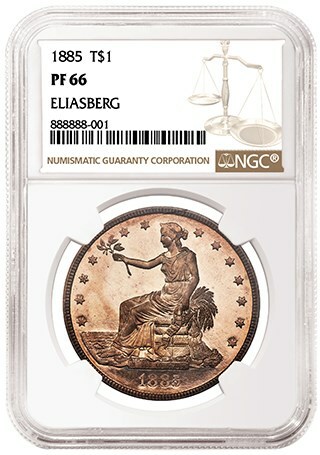 "I remember when we certified this coin more than 20 years ago," said NGC Chairman Mark Salzberg, who has been an NGC Grading Finalizer since 1988. "It is a spectacular rarity with an outstanding pedigree. It was an honor to grade it, and I am delighted that NGC certification helped it to achieve such a phenomenal price." 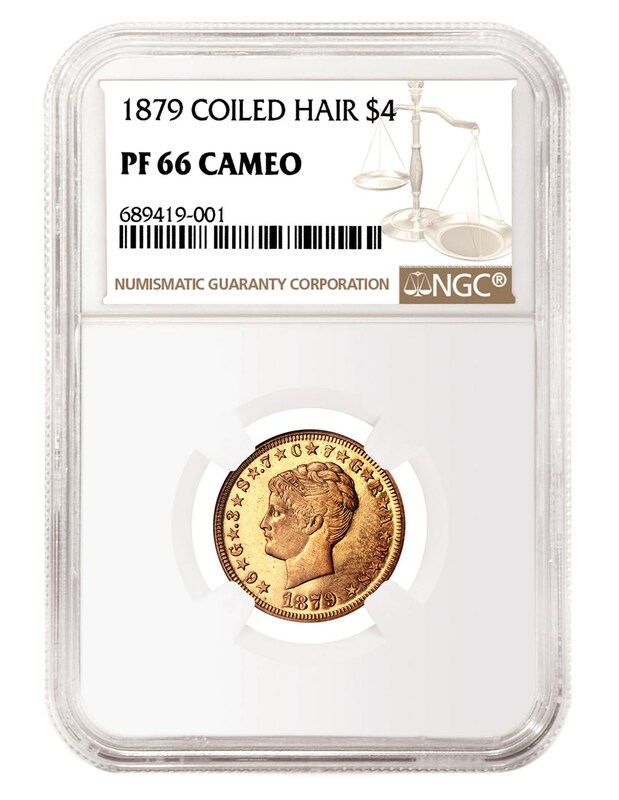 The price realized by the Eliasberg specimen is the second-highest at auction for an NGC-certified coin, surpassed only by a 1787 Brasher Doubloon. Graded NGC MS 63, that coin was sold by Heritage Auctions for $4,582,500 in January 2014. 1884 Trade Dollar Proof, graded NGC PF 66. Realized: $1,140,000. 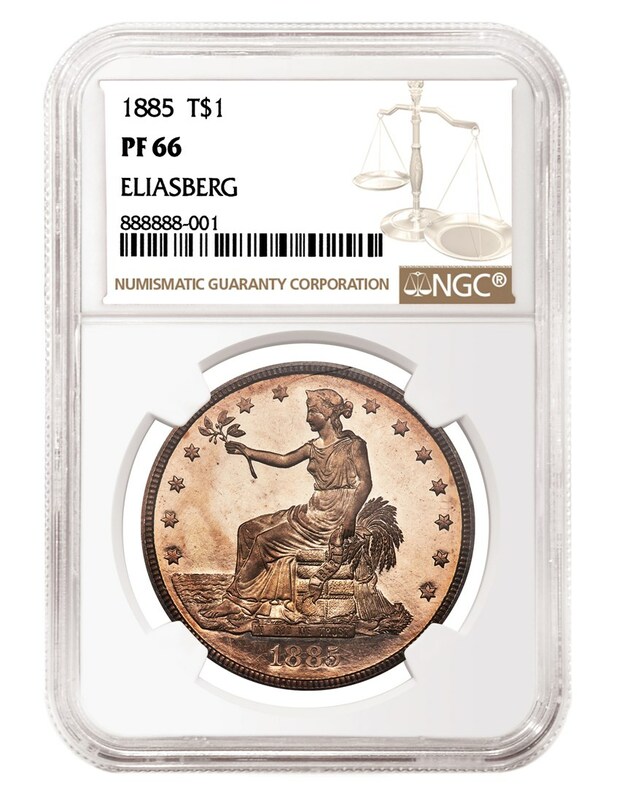 Meanwhile, an 1884 Proof Trade Dollar, also graded NGC PF 66 and also pedigreed to the Eliasberg collection, realized $1,140,000 in the same sale. Only 10 are known, and this is the second-finest certified example. After some 264 were struck, orders were issued not to make the 1884 Trade Dollar available to collectors, and presumably nearly all were melted down. A Mint employee, probably the superintendent himself, is believed to have legally acquired these 10 under a standard Mint policy. 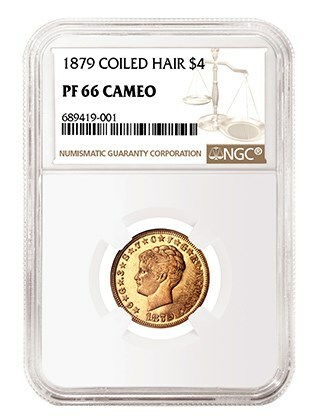 1879 Coiled Hair "Stella", graded NGC PF 66 Cameo. Realized: $1,050,000. 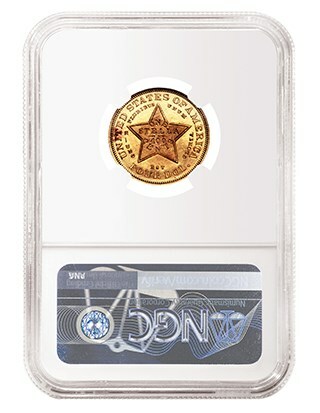 Another NGC-certified coin, an 1879 Coiled Hair $4 Stella, surpassed the $1 million mark. Graded NGC PF 66 Cameo, it realized $1,050,000. According to Heritage’s researchers, only 13 examples of the famed Coiled Hair “Stella” pattern are known to exist. The Stella patterns were created at the same time as the Trade Dollar endeavor was winding down, and they were created for a similar reason. The Stella was seen as a potential way to facilitate international trade, which was often achieved through gold coins from European countries. A small number of Stellas were struck for Congress to examine, but ultimately, the experiment went nowhere. 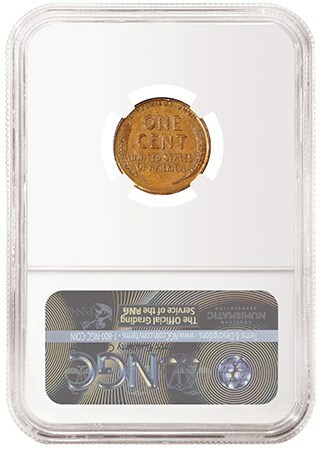 1943 Bronze Wheat Cent, graded NGC AU 53-The Don Lutes Jr. Discovery Specimen. Realized: $204,000. 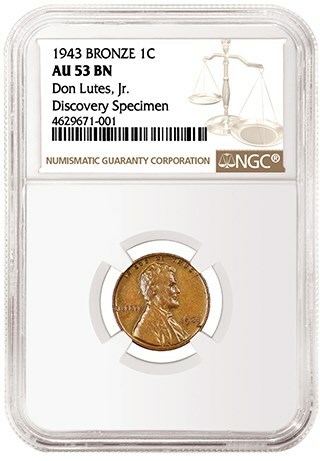 Another noteworthy coin is a 1943 Bronze Cent, graded NGC AU 53, that realized $204,000. It is pedigreed as "The Don Lutes Jr. Discovery Specimen," named after the teenager who found it in his change from his school cafeteria in 1947. All 1943 cents were supposed to have been struck in zinc-coated steel so that copper could be conserved for the war effort. Nevertheless, a few were mistakenly struck in copper and entered circulation, with this particular specimen being the first publicly identified. Mr. Lutes, who had kept the cent for decades, submitted it to NGC for certification last year.